Royale... The Luxury Collection... Inpired by the City of Love, Paris! Limited Edition! Knitter's Pride is here to delight with a romantic, timeless Parisian inspired Interchangeable Gift Set. Each interchangeable needle is made of Knitter's Pride signature colorful wood, in a striking new striped pattern with shiny brass tips adorning the ends of the needles. A different color for every needle makes it easy to identify each size. 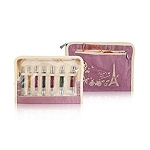 The cords and connectors are carefully packed in a stylish Paris themed silk fabric multi-purpose zipper bag. 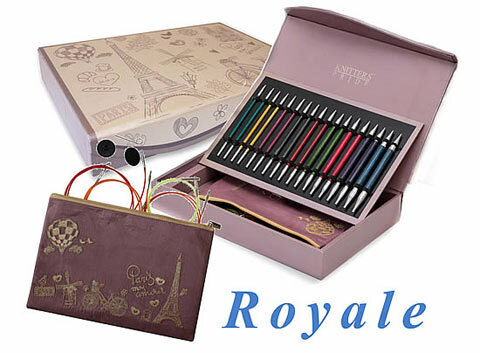 Royale Interchangeable Needles Set will make a wonderful gift for the season, presented in a handsome pearlized box highlighting Parisian history.